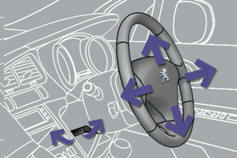 When stationary , pull the control lever to release the adjustment mechanism. Adjust the height and reach to suit your driving position. Push the control lever to lock the adjustment mechanism. As a safety precaution, these operations should only be carried out while the vehicle is stationary.